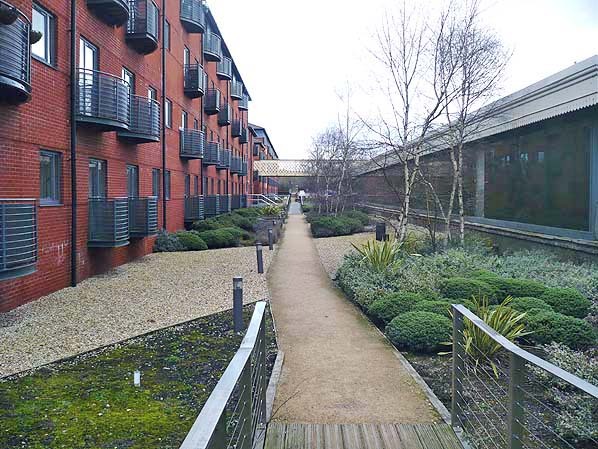 Present state: The station frontage has been restored and sections of both the up and down platforms have been incorporated into an office, hotel and residential complex. Notes: Wolverhampton Low Level was the Great Western Railway (GWR) company’s main line station in the important Black Country town. The station was authorised as part of an extension to the Oxford, Worcester & Wolverhampton Railway (OW&WR) on 14 August 1848. The authorising Act was for a shared station with the Birmingham, Wolverhampton & Dudley Railway (BW&DR) which was building a line to link the GWR station at Birmingham Snow Hill with Wolverhampton. There was a great deal of wrangling between a number of railway companies with regard to who should serve Wolverhampton and how. The London & North Western Railway (LNWR) was particularly active in trying to prevent the GWR from creating a route to the north. On 31 August 1848 the BW&DR was absorbed into the GWR which gave them their access to Wolverhampton, much to the chagrin of the LNWR. The station opened as simply ‘Wolverhampton’ on 1 July 1854. It was adjacent to another station, on the Stour Valley line, which was a joint facility of the LNWR and the Shrewsbury & Birmingham Railway (S&B). Although initially called ‘Wolverhampton Joint’ the GWR station, being at a lower elevation, quickly became referred to as the ‘low level station’, the LNWR/S&B station being referred to as the ‘high level station’. Wolverhampton GWR station was given an imposing frontage block designed by Sir John Fowler, Engineer to the OWWR, whilst Brunel, on behalf of the GWR, designed the layout. This was the last of Brunel’s one-sided single-platform stations with a central crossover and a 115ft span iron-trussed and pitched roof, 575ft long. Blue engineering brick screen walls supported the roof, with blind arcading which originally contained lunettes. 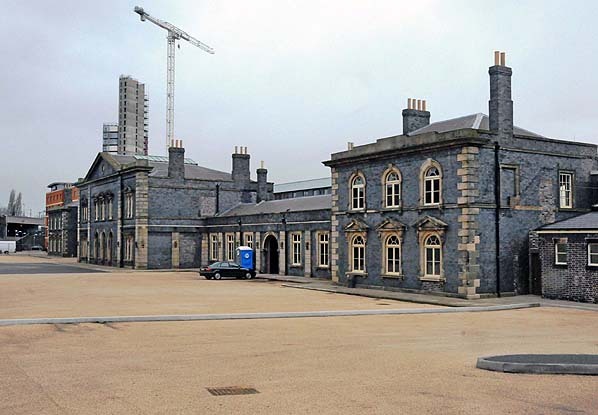 The two-storey Italianate station building was also in blue engineering brick – not a material commonly associated with classical buildings, but it was a specialty of south Staffordshire. The centrepiece had a large pediment, and its round-headed windows were crowned with small pediments on scrolled brackets to match the rusticated quoins and ground-floor openings. On either side stretch plainer wings, one of two storeys and the other single, terminating in hipped-roof pavilions with ‘reversed fenestration’ – plain above and pedimented below. The lofty booking hall had heavy, squre pilasters, mid- and full-height cornices, and a coved ceiling up in the roof. The station is a Grade II listed structure. This description is drawn from G Biddle’s Britain’s historic railway buildings (2003). The track layout at the station was designed by Henry Robertson. There were four through lines served by island platforms. There were crossovers between the through lines that were level with the main entrance. The crossovers separated one of the island platforms into two sections. The curious arrangement allowed up (Birmingham direction) and down (Shrewsbury direction) trains to arrive at the same platform at the same time. An iron footbridge linked the platforms. There was also a bay at each end of the station on the down side of the line (Shrewsbury direction). Goods lines passed to the east of the station. The track was mixed gauge, broad gauge 7ft 0¼in and narrow gauge 4ft 8½in. The broad gauge was preferred by the GWR who wanted to extend it as far north as Liverpool. The OW&WR had also built their line as broad gauge. However in August 1846 Parliament had passed the Gauge Act. The Act was brought about through the work of the Gauge Commission and it ensured that all new railways constructed in England, Scotland and Wales would be to what became the standard gauge of 4ft 8½in. The GWR was allowed to continue with its broad gauge but the Act ensured that Wolverhampton was the most northerly broad gauge station; despite the GWR aspirations it would remain so. At the time of opening Wolverhampton was served by trains of the OW&WR that ran to and from Oxford via Worcester. On 1 September 1854 the S&B was absorbed into the GWR which meant that the company gained a half share in the high level station. The S&B had aligned itself with the GWR after being obstructed by the LNWR, Despites its name the company had never been able to reach Birmingham. It had obtained running rights over the Stour Valley line into Birmingham but the obstacles put in its way by the LNWR had driven it into the GWR fold. The GWR were interested in the S&B as that company provide a route to the north. The GWR had obtained an Act in 1852 for the ‘Wolverhampton Junction Railway’ which made a connection with the S&B route to the north-west of its Wolverhampton station at Stafford Road. That connection opened on 14 November 1854 and all trains were diverted to run into the low level station. On the same day as the S&B connection opened the line between Birmingham Snow Hill and Priestfield Junction opened. Despite all of the efforts of the LNWR the GWR had its route between London and the north. The only issue was that the GWR line southwards was broad gauge and north of Wolverhampton it was standard; mixed gauge did, however, extend from Wolverhampton to Birmingham Snow Hill. In April 1856 the GWR/OW&WR officially named the station Wolverhampton Low Level. The GWR introduced a Birmingham – Birkenhead express service on 1 May 1857. Mixed gauge track was extended to London by 1861 and a London Paddington – Birkenhead service was introduced on 1 October 1861. In 1863 the OW&WR was absorbed into the GWR. As the broad gauge could not be extended northwards the GWR decided that it was pointless to continue with it at Wolverhampton. On 1 November 1864 Birmingham Snow Hill – Wolverhampton passenger trains became standard gauge only and the broad gauge was removed shortly after. On 1 July 1869 the former OW&WR lines were also converted to standard gauge leaving the station with standard gauge track only. The track layout at the station was altered. There were still four through lines but only two of them were served by platforms. Instead of the previous arrangement there was just a single up and a single down through platform. Both were very long and could handle more than one train at a time. Between the platforms there were two through lines used for moving empty stock. Bay platforms were retained at each end of the down platform. On 1 November 1872 the Midland Railway (MR) made a connection with the GWR just to the south-east of Wolverhampton Low Level station when they opened their Wolverhampton and Walsall Railway. A short distance to the east of the Low Level station the MR opened a goods station. During the early days of the Wolverhampton and Walsall railway construction the MR had thought that it would run passenger services to and from Wolverhampton Low Level but it became more involved with the LNWR, and via a connection to the High Level station its trains ran that way instead. In April 1899 two new signal boxes were opened at Wolverhampton Low Level. Wolverhampton South Box was located between the up and the down lines at the south end of the station. Wolverhampton North Box was located on the down side of the line on the north side of the Wednesfield Road bridge. A carriage shed and additional sidings opened to the east of the station at the same time. In 1902 the station footbridge was strengthened. The work had to be carried out owing to an increase in use because of the Wolverhampton Art and Industrial Exhibition that was held in that year. 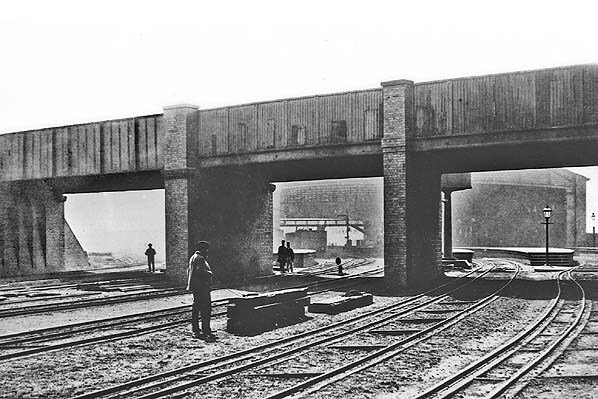 The up platform was extended at the Birmingham end in 1911. In 1933-34 the trainshed roof was removed because it had corroded badly. In its place the GWR installed its standard-style pitched awnings, together with a covered footbridge and tall lift towers. At the same time a new booking office with five ticket windows was built within the booking hall and a new telegraph department was added to the stationmaster's office. Both of the through platforms were extended. Befitting its status as an important major station in March 1930 the GWR replaced the gas lighting with an electric system. At 5.33am on 17 July 1939 the IRA detonated a bomb at Wolverhampton Low Level. The device was placed in a case and left at the parcels office on the previous evening. The explosion wrecked the parcels office and blew out the windows of a carriage that was standing at the platform. A porter narrowly escaped the full force of the blast. Two ton electric goods lifts were installed in July 1944. On 1 January 1948 Wolverhampton Low Level became part of British Railways [Western Region] (BR[WR]). Wolverhampton Low Level was a busy station during the 1950s being served by main line and local trains. On 1 January 1963 Wolverhampton Low Level was transferred to British Railways [London Midland Region] (BR[LMR]). The LMR had controlled Wolverhampton High Level since 1 January 1948 and the lines through that station were being modernised and electrified. Because of the works at the High Level station Wolverhampton Low Level had a very busy period between 1963 and 1967 when many services from the LNWR lines were diverted to it. The busy period was short-lived and as soon as the electrification works were complete the decline began. 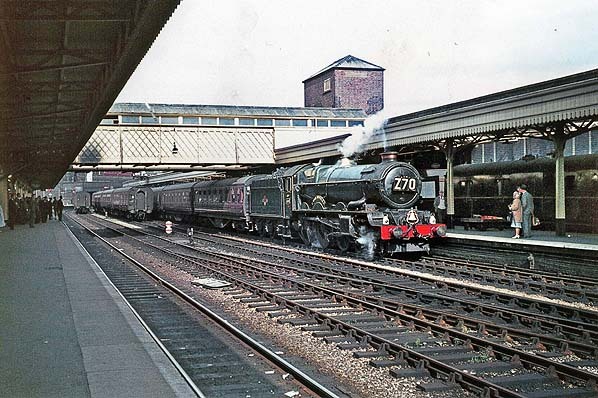 On 5 March 1967 the last Birkenhead – Paddington express trains ran and other express services were diverted to run through Wolverhampton High Level station via the newly installed Wolverhampton North Junction. 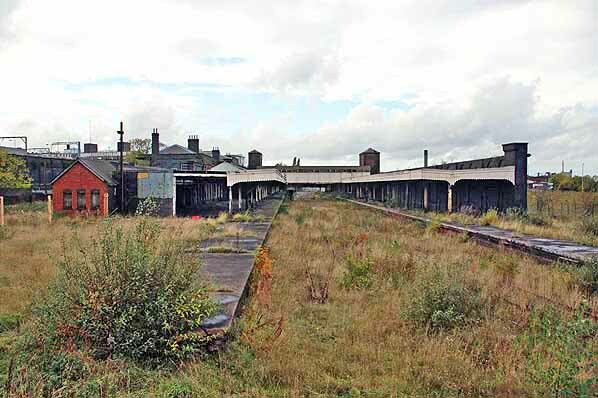 In 1969 the remaining Shrewsbury line services were diverted away from the station leaving only the Snow Hill service which ran to and from the south end of the former down platform. The line between the station and Cannock Road Junction was closed and lifted. All of the other platforms were taken out of passenger use. Despite local protest the Snow Hill Service was suspended on 6 March 1972 and Wolverhampton Low Level station closed to passengers. The Snow Hill service was never reintroduced. The original station frontage buildings of Wolverhampton Low Level station seen on 2 March 2009. Wolverhampton Low Level station shown on a 25-inch scale map from 1886. The High Level station of the London & North Western Railway can also be seen. The Wolverhampton high and low level stations shown on a 25-inch scale map from 1913. The railway facilities had been extended on the north side of the station. The railways of Wolverhampton shown on a Railway Clearing House map from 1915. The Great Western Railway lines are shown in yellow. The London & North Western Railway lines are shown in red and those of the Midland Railway in greem. The Midland Railway had a connection to Wolverhampton Low Level as can be seen from the map. It was not however used by regular passenger services. Wolverhampton Low Level station looking south-east in the late 1850s. The mixed gauge track that ran through the station at that time is clearly shown. South from Wolverhampton the lines were built as broad gauge whilst those to the north were standard. By the late 1850s there was mixed gauge between London and Wolverhampton. The mixed gauge track extended north to Stafford Road where there was a locomotive works and shed. 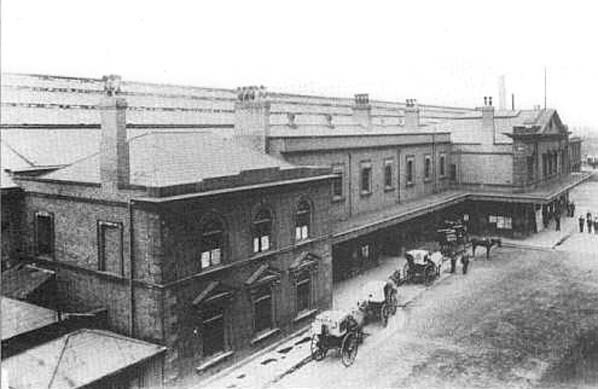 The station frontage at Wolverhampton Low Level station seen in the early Twentieth century. The view was taken from the high level station of the London & North Western Railway. 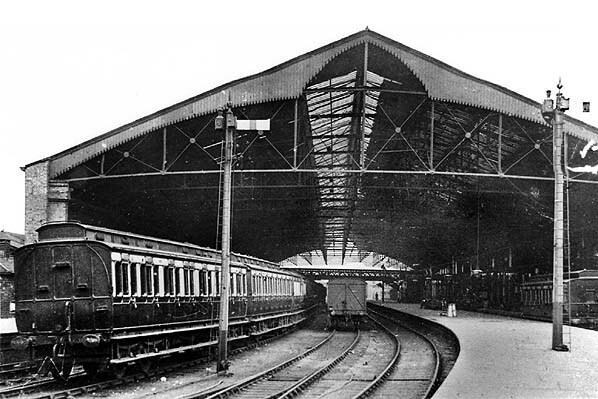 A view of the Wolverhampton Low Level trainshed seen looking south-east in 1905. Alterations had been carried out to the platforms when the broad gauge lines had been removed in 1869. 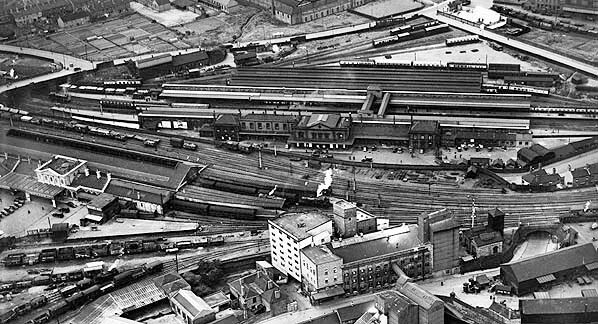 Wolverhampton Low Level station seen from the air in June 1938. A view looking north-west along the down platform at Wolverhampton Low Level station on 9 September 1962. Arriving at the up platform is an ex-GWR 'King' class locomotive on a special working that was run to mark the phasing out of this class of locomotive. 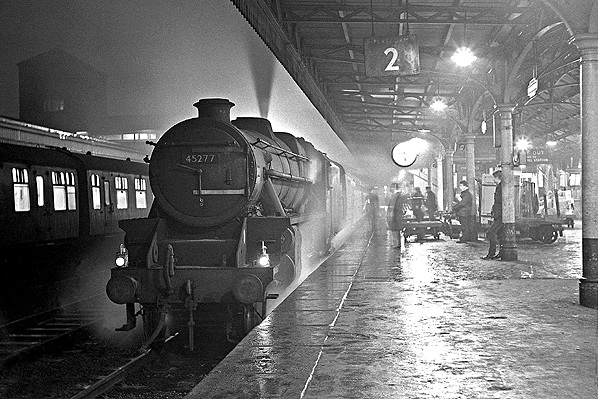 On 10 January 1967 a Paddington to Chester service is seen at Wolverhampton Low Level. The train had arrived behind a Brush Type 4 locomotive (class 47) which was replaced with 5MT (Black 5) locomotive number 45277 of Chester shed for the final leg of the journey. Wolverhampton Low Level looking north-west in October 2005. Looking south-east at Wolverhampton Low Level station on 3 March 2016. The view is taken from the trackbed of the through lines. The down through line platform can be seen to the right. In the distance is the footbridge that linked the up and down through line platforms.